The Ryan Balfour trained Balf's Choice made a sensational run at the leaders of the All Star Mile overnight. From 24th to 8th position and still climbing at a rapid rate sees the fields 4th highest mile racewinner of the 130 entrants in with a real chance to make the field. 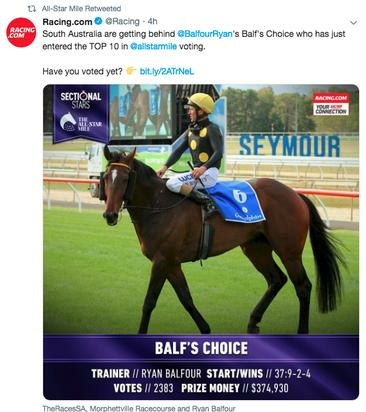 South Australian voters have made the strong push for their chosen runner and with racing in SA at one of its lowest points it's great for the industry to join in and get behind their horse. With the Balfour Stable rallying its troops it seems the RBR media machine is expecting to draw even more support from the likes of its local TV, Radio and social media influencers.